Ita Rienus, an Imperial battlemage, is a Journeyman of the Mages Guild who offers advanced Mysticism training and recharging services and sells spells at the Bravil Guild Hall. She will also train by herself: at 6am, she gets out of bed and enters the Guild Basement, where she will wander around for a couple of hours. At 8am, there is a 40% chance that she will cast some Mysticism spells, and will continue to do so for two hours. After training, she heads upstairs and wanders around there, conversing with her fellow guildmates. At 2pm, she once again heads down into the basement, where she will spend another four hours wandering. At 6pm, she eats dinner on the ground floor with the other Guild members for three hours. Afterward, she will exit the Guild for some fresh dusk air, and will wander around near Bravil's north entrance for the next two hours, before heading back to the Guild and her bed at 11pm. She wears middle-class attire consisting of a burgundy linen shirt, burgundy linens and a pair of thick cowhide shoes. Her only other possession is a leveled amount of gold. She doesn't carry any weapons, relying instead on a set of medium-high level Illusion spells. These are also the same spells that you can buy from her for a cheap price, since her Mercantile is a mere 16. She will always offer her services when not sleeping, eating or taking her daily trip to the city's north entrance. When you meet her for the first time, she will say: "Ita Rienus, Spells, Recharging and Training in Mysticism. And idle chatter. At your service." 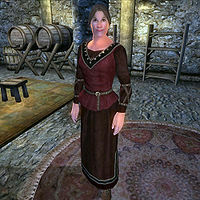 On her town of choice, her geographic knowledge shines through: "Bravil is an important trade center, and a rich melting pot of Imperial, Khajiit, and Argonian cultures. And, yes, a bit shabby and shopworn." She will also point you towards Delphine Jend, when you ask her about the Guild: "Delphine can get you a spell to summon bound armor, if you're interested. And if you're able, of course." If you haven't joined yet she will comment: "Kud-Ei would be the one to talk to, if you wish to join. Otherwise, just find one of the other local guild heads." As an advanced trainer, Ita can provide you with the necessary reference for the Mysticism Master Training quest. Once your mysticism skill level reaches 70, speak to her, and choose the "training" option, which will trigger the quest and this dialogue: "You know as much about Mysticism as I do. If you wish to learn more, Dagail can teach you. Visit her at the Leyawiin Guild hall. But be aware that she's a bit... odd." "Ita Rienus knows more about the geography of Tamriel than anyone I've ever met. Apparently, she knows quite a bit about Mysticism as well." "Surprising, don't you think, since she never seems to leave that guild hall." "I heard Ita Rienus talking about the geography of Tamriel again. She's very knowledgeable." "There's no doubt that she knows a lot. Years of studying all sorts of things, I'd expect." "Do you think anyone in Bravil knows more about Tamriel than Ita Rienus?" "Perhaps she grew bored with studying nothing but enchantments and spells. I know I would." "How does Ita Rienus know so much about Tamriel?" "I would assume she's travelled extensively. Must have been some time ago, though, since she never seems to leave the guild hall now." Mysticism Training: You must begin to repel the forces of Oblivion before the master mystic will train you. While she was supposed to train in the basement all day long until 6pm, another wandering script will prevail and cut off the spell-casting one. This page was last modified on 20 October 2015, at 05:31.